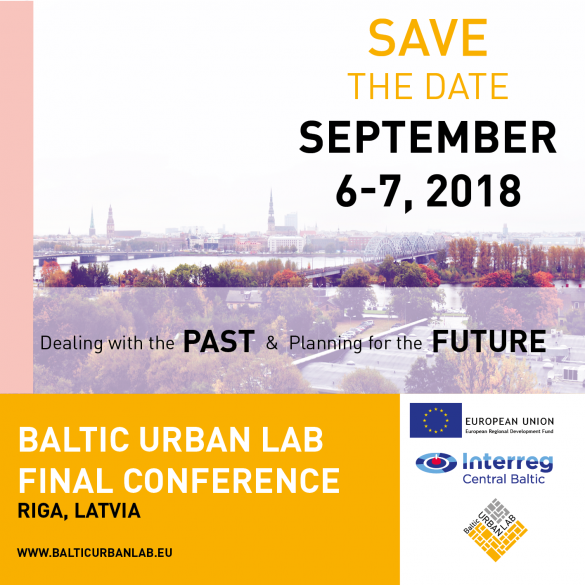 Baltic Urban Lab Final Conference “Dealing with the past & Planning the future – turning urban brownfield into possibilities” will be held in Riga, Latvia, during 6-7 September 2018. Cities around the Baltic Sea region are invited to join the discussions on how cities can better solve complex challenges related to brownfield redevelopment, and how to utilize brownfields’ full potential to support sustainable urban development. Close cooperation and partnerships between different actors like land-owners, developers, citizens and the city are necessary from the beginning of the redevelopment process. Two crucial topics will be covered around brownfield development – how to deal with the site’s past and possible contamination of soil and at the same time develop visions and plan for the future land-use of the site in cooperation with stakeholders. Nordregio’s Research Fellow Sandra Oliveira e Costa will participate in the session “Towards integrated and partnership based planned of brownfields” during which she will share the lessons learned from the Baltic Urban Lab Project. Sandra will also moderate an interactive session “Planning the future – co-creating visions and land-use plans” which will be held on the second day of the event. The two days will be filled with keynotes, discussions on how the cities could together tackle the challenges surrounding brownfield regeneration in the Baltic Sea Region as well as getting to know the outputs of the project – all four Pilot Sites will be representing their main achievements during the Final Conference. The conference language is English. Participation in the conference is free of charge. Please register here by 22 August 2018!